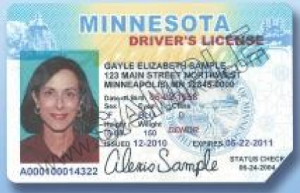 Minnesota Adopts New Method for Invalidating Driver’s Licenses - TokenWorks, Inc. 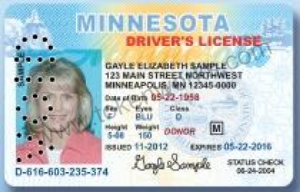 Starting July 6, 2015, the Minnesota Department of Public Safety Driver and Vehicle Services division (DVS) changed the way expired or otherwise invalid driver’s licenses and identification (ID) cards are marked. Previously, licenses and ID cards that were invalid had the bottom right corner removed. Going forward, each DVS office will punch invalid licenses and ID cards across the photo with the word “VOID”. This new method brings Minnesota into compliance with the Federal Motor Carrier Safety Administration’s Commercial Driver’s License Standards which states that for a document to be considered invalidated, it should be perforated with the word “VOID”. This conspicuous marking should prevent the casual observer from mistaking an invalid document for a valid document, even in low light conditions. While the federal law pertains to commercial driver’s licenses, all licenses and ID cards in Minnesota will now be invalidated in the same way, to reduce any chance of confusion. Minnesota’s DVS obtained a federal grant to cover the cost of supplying each division office with void perforators. A Minnesota driver’s license or ID card becomes invalid when 1) application is made to renew the license or ID card, 2) application is made for a duplicate license or ID card, or 3) application is made for a license or permit by a person transferring from another U.S. state. In 2014, the Minnesota DVS issued over 1.3 million driver’s licenses and ID cards. Copyright © 2019 TokenWorks, Inc.